A fortified Flemish castle once stood next to the château, and it is said that in 1430 Joan of Arc passed by its walls as a prisoner of the Burgundians and later the English. Just over one hundred years later, Marie d’Olhain and Jacques de Hamel Bellenglise gave birth to a daughter named Nicole. Nicole became Lady of Honor to Mary Queen of Scots, whose husband was the son of the French King Henri II and Catherine de Medici. When Mary was taken into captivity, Nicole followed her, and upon Mary’s execution, Queen Elizabeth I gave Nicole Mary’s silver cross. The castle remained in the hands of the d’Olhain/Bellenglise family for the next ten generations. 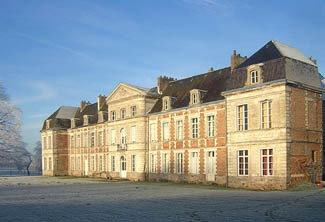 The present day château was built in 1746 by Antoine-Constant de Hamel. His son, Paul-Joseph, fled to Belgium during the French Revolution, but he was soon captured and returned to France—barefoot in the snow—and was soon guillotined after a sham trial. The château was confiscated by the state and sold to Citizen Servatius. In 1827 the son of Paul-Joseph bought back his father’s estate. The château would see several more owners until it fell into a state of complete dilapidation. The property was sold to Patrice and Chantal de Saulieu in 1987 who have been restoring it ever since. As this is a bed-and-breakfast château only, for regular meals the better restaurants are in Arras. Rates include a continental breakfast. Grand-Rullecourt is 25 km west of Arras. Take either D339 or D59. At Avesnes-le-Comte, continue on D75. You really need your own car to get around in the area. When you drive through surrounding parkland and the gates of the Château de Grand Rullecourt and continue down the sweeping drive, you’ll feel you’re embarking on one of those grand country weekends from another age. Your delightful and energetic hosts, Patrice and Chantal Saulieu, have devoted well over twenty years to restoring their imposing home and welcoming guests from all over the world. You only need ask and they’ll lead you on a tour through the rooms and chapel, while regaling you with story after story. They share their home as a bed and breakfast, not as a full-service hotel. Expect breakfast to be the continental type of croissants and coffee and plan to take your meals while you’re out sightseeing. The château’s atmosphere is one of authenticity that overflows with character. Chandeliers hang over the salons, wood floors suitably creak. Furnishings are representative of the period. Guest rooms are more than spacious with comfy beds to welcome you at the end of the day. Basic bathrooms hold showers. If you have any questions about how to best enjoy the area, Patrice and Chantal will be happy to help—English spoken! And you’ll be heartened to know that your stay here helps with their ongoing restoration efforts. Charming hospitality and loads of history!